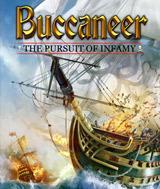 Buccaneer is a single and multiplayer game where you will strive to become the most infamous pirate captain of all time and etch your name in The Hall of Infamy. Set against a backdrop of the sunny Caribbean, you will control a variety of classic tall ships, bristling with cannons, and plunder your way through a 50-mission campaign, or while going head to head against other cut-throats online. Buccaneer employs a simple and intuitive control system that will let even brand new sailors jump straight into the action and begin your career in piracy. With a wide variety of non-linear single player missions and a choice of more than a dozen fully customizable ships, Buccaneer will have budding pirate captains clamoring for more!